Blue rubber bleb nevus syndrome (BRBNS) is a rare condition that is characterized by numerous malformations of the venous system that significantly involve the skin and visceral organs. This condition was initially discovered in 1860 by Gascoyen. However, it was later made famous in 1958, by William Bennett Bean for which the disease has been termed "bean syndrome," later referenced as blue rubber bleb nevus syndrome. BRBNS is an important condition due to the potential for significant bleeding which can be fatal. 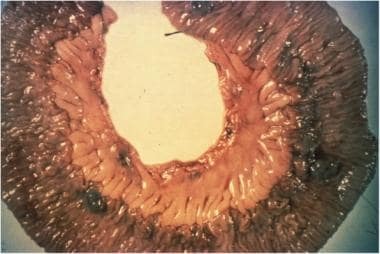 Also see the article, Dermatologic Manifestations of Gastrointestinal Disease. 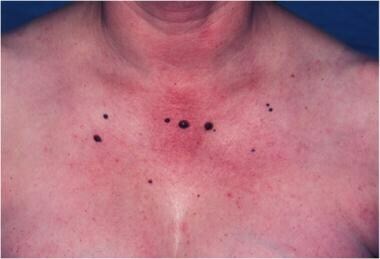 Multiple scattered blue to black rubbery papules and nodules involving the mid-chest region. 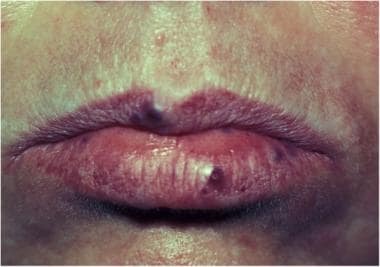 Purple to blue/black papules involving the upper and lower lips. Multiple blue to black pigmented, rubbery, blood-filled sacs, which are easily compressible involving the GI tract. Blue rubber bleb nevus syndrome (BRBNS) has been reported to occur in people of all races;  however, whites appear to be most frequently affected. The prognosis for blue rubber bleb nevus syndrome (BRBNS) depends on the extent of visceral organ involvement and complications related to the degree of symptoms. Most patients are expected have a normal life span. Suksamanapun N, Trakarnsanga A, Akaraviputh T. Blue rubber bleb nevus syndrome. Endoscopy. 2011 Dec. 43 Suppl 2 UCTN:E411-2. [Medline]. Senturk S, Bilici A, Miroglu TC, Bilek SU. Blue rubber bleb nevus syndrome: imaging of small bowel lesions with peroral CT enterography. Abdom Imaging. 2011 Oct. 36(5):520-3. [Medline]. Huang W, Rhodes A. A Case of Blue Rubber Bleb Nevus Syndrome with Gastrointestinal and Central Nervous System Involvement. Pediatr Dermatol. 2011 Oct 20. [Medline]. Turk BG, Turkmen M, Karaarslan IK, et al. Blue rubber bleb nevus syndrome: a case report with dermatoscopic features. Clin Exp Dermatol. 2011 Mar. 36(2):211-3. [Medline]. Krishnappa A, Padmini J. Blue rubber bleb nevus syndrome. Indian J Pathol Microbiol. 2010 Jan-Mar. 53(1):168-70. [Medline]. Agnese M, Cipolletta L, Bianco MA, Quitadamo P, Miele E, Staiano A. Blue rubber bleb nevus syndrome. Acta Paediatr. 2010 Apr. 99(4):632-5. [Medline]. Hasosah MY, Abdul-Wahab AA, Bin-Yahab SA, Al-Rabeaah AA, Rimawi MM, Eyoni YA. Blue rubber bleb nevus syndrome: extensive small bowel vascular lesions responsible for gastrointestinal bleeding. J Paediatr Child Health. 2010 Jan. 46(1-2):63-5. [Medline]. Nobuhara Y, Onoda N, Fukai K, Hosomi N, Ishii M, Wakasa K. TIE2 gain-of-function mutation in a patient with pancreatic lymphangioma associated with blue rubber-bleb nevus syndrome: report of a case. Surg Today. 2006. 36(3):283-6. [Medline]. Fleischer AB Jr, Panzer SM, Wheeler CE. Blue rubber bleb nevus syndrome in a black patient: a case report. Cutis. 1990 Feb. 45(2):103-5. [Medline]. Yuksekkaya H, Ozbek O, Keser M, Toy H. Blue rubber bleb nevus syndrome: successful treatment with sirolimus. Pediatrics. 2012 Apr. 129(4):e1080-4. [Medline]. Park CO, Park J, Chung KY. Blue rubber bleb nevus syndrome with central nervous system involvement. J Dermatol. 2006 Sep. 33(9):649-51. [Medline]. Esposito C, Giurin I, Farina A, Ascione G, Miele E, Staiano A. Blue rubber bleb nevus: an uncommon cause of intestinal intussusception. Eur J Pediatr. 2012 Jul. 171(7):1139-40. [Medline]. Starr BM, Katzenmeyer WK, Guinto F, Pou AM. The blue rubber bleb nevus syndrome: a case with prominent head and neck findings. Am J Otolaryngol. 2005 Jul-Aug. 26(4):282-4. [Medline]. Xu Y, Zhou B, Zhang M, Luo D. An unusual case of blue rubber bleb nevus syndrome with unilateral linear distribution. Indian J Dermatol Venereol Leprol. 2013 Mar-Apr. 79(2):269-70. [Medline]. Mejia-Rodriguez S, Valencia-Herrera A, Escobar-Sanchez A, Mena-Cedillos C. Dermoscopic features in Bean (blue rubber bleb nevus) syndrome. Pediatr Dermatol. 2008 Mar-Apr. 25(2):270-2. [Medline]. McCarthy JC, Goldberg MJ, Zimbler S. Orthopaedic dysfunction in the blue rubber-bleb nevus syndrome. J Bone Joint Surg Am. 1982 Feb. 64(2):280-3. [Medline]. Doi T, Masumoto N, Sonoda M, Nakayama H, Mizuno Y. Blue rubber bleb nevus syndrome with knee joint disorder. Pediatr Int. 2016 Apr 26. [Medline]. Garen PD, Sahn EE. Spinal cord compression in blue rubber bleb nevus syndrome. Arch Dermatol. 1994 Jul. 130(7):934-5. [Medline]. Giordano C, Battagliese A, di Gioia CR, et al. Blue rubber bleb nevus syndrome and pulmonary hypertension: an unusual association. Cardiovasc Pathol. 2004 Nov-Dec. 13(6):317-22. [Medline]. Singal A, Vohra S, Sharma R, Bhatt S. Blue Rubber Bleb Nevus Syndrome with Musculo-skeletal Involvement and Pulmonary Stenosis. Indian Pediatr. 2016 Jun 8. 53 (6):525-7. [Medline]. Ochiai D, Miyakoshi K, Yakubo K, Fukuiya T, Yoshimura Y. Familial blue rubber bleb nevus syndrome in pregnancy with spinal epidural involvement. Case Rep Obstet Gynecol. 2013. 2013:141506. [Medline]. Bouchghoul H, Nizard J. Pregnancy and blue rubber bleb nevus syndrome. Eur J Obstet Gynecol Reprod Biol. 2013 Jul. 169(2):415-6. [Medline]. Shannon J, Auld J. Blue rubber bleb naevus syndrome associated with cortical blindness. Australas J Dermatol. 2005 Aug. 46 (3):192-5. [Medline]. Yarlagadda R, Menda Y, Graham MM. Tc-99m red blood cell imaging in a patient with blue rubber bleb nevus syndrome. Clin Nucl Med. 2008 May. 33(5):374-6. [Medline]. Bak YT, Oh CH, Kim JH, Lee CH. Blue rubber bleb nevus syndrome: endoscopic removal of the gastrointestinal hemangiomas. Gastrointest Endosc. 1997 Jan. 45(1):90-2. [Medline]. Gallo SH, McClave SA. Blue rubber bleb nevus syndrome: gastrointestinal involvement and its endoscopic presentation. Gastrointest Endosc. 1992 Jan-Feb. 38(1):72-6. [Medline]. Apak H, Celkan T, Ozkan A, Yildiz I, Aydemir EH, Ozdil S, et al. Blue rubber bleb nevus syndrome associated with consumption coagulopathy: treatment with interferon. Dermatology. 2004. 208(4):345-8. [Medline]. Gonzalez D, Elizondo BJ, Haslag S, Buchanan G, Burdick JS, Guzzetta PC, et al. Chronic subcutaneous octreotide decreases gastrointestinal blood loss in blue rubber-bleb nevus syndrome. J Pediatr Gastroenterol Nutr. 2001 Aug. 33(2):183-8. [Medline]. Salloum R, Fox CE, Alvarez-Allende CR, Hammill AM, Dasgupta R, Dickie BH, et al. Response of Blue Rubber Bleb Nevus Syndrome to Sirolimus Treatment. Pediatr Blood Cancer. 2016 Jun 8. [Medline]. Olsen TG, Milroy SK, Goldman L, Fidler JP. Laser surgery for blue rubber bleb nevus. Arch Dermatol. 1979 Jan. 115(1):81-2. [Medline]. Mavrogenis G, Coumaros D, Tzilves D, Rapti E, Stefanidis G, Leroy J. Cyanoacrylate glue in the management of blue rubber bleb nevus syndrome. Endoscopy. 2011. 43 Suppl 2 UCTN:E291-2. [Medline]. Morris L, Lynch PM, Gleason WA Jr, Schauder C, Pinkel D, Duvic M. Blue rubber bleb nevus syndrome: laser photocoagulation of colonic hemangiomas in a child with microcytic anemia. Pediatr Dermatol. 1992 Jun. 9(2):91-4. [Medline]. Moser CM, Hamsch C. Successful treatment of cutaneous venous malformations in a patient with blue rubber bleb naevus syndrome by Nd:YAG laser. Br J Dermatol. 2012 May. 166(5):1143-5. [Medline]. Nakajima H, Nouso H, Urushihara N, Fukumoto K, Yamoto M, Miyake H, et al. Blue Rubber Bleb Nevus Syndrome with Long-Term Follow-Up: A Case Report and Review of the Literature. Case Rep Gastrointest Med. 2018. 2018:8087659. [Medline]. [Full Text]. Ng WT, Kong CK. Argon plasma coagulation for blue rubber bleb nevus syndrome in a female infant. Eur J Pediatr Surg. 2003 Apr. 13(2):137-9. [Medline]. Fishman SJ, Smithers CJ, Folkman J, Lund DP, Burrows PE, Mulliken JB, et al. Blue rubber bleb nevus syndrome: surgical eradication of gastrointestinal bleeding. Ann Surg. 2005 Mar. 241(3):523-8. [Medline]. Ng EK, Cheung FK, Chiu PW. Blue rubber bleb nevus syndrome: treatment of multiple gastrointestinal hemangiomas with argon plasma coagulator. Dig Endosc. 2009 Jan. 21(1):40-2. [Medline]. Lower extremity cutaneous lesions described in blue rubber bleb nevus syndrome, consisting of blue rubbery papules and nodules with an easily compressible smooth surface. Histopathology reveals blood-filled vessels, composed of single layers of endothelium, surrounded by connective tissue.